442nd's Motto "Go For Broke"
I received an email from Chuck today asking about the Japanese translation of the 442nd’s motto “Go For Broke”. As most of you know the 442nd is an infantry regiment of overwhelmingly American soldiers of Japanese ancestry who fought in WWII while many of their families were in internment camps. To say the 442nd was the most decorated unit does not capture what they accomplished and how they accomplished it. According to Wikipedia’s 442nd Infantry Regiment (English) between the 14,000 men, 9,486 Purple Hearts were awarded. 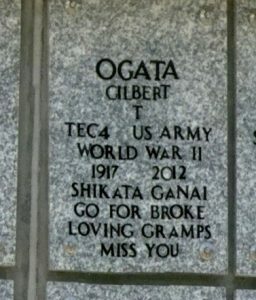 Chuck wanted to know if I thought that shikata ga nai was a suitable translation for “Go For Broke” and showed me this photo of his father-in-law’s headstone. I think of shikata ga nai as “It Cannot Be Helped”. Something one says in resignation. Listen to how George Matsui of the 442nd sums it up in this short interview. “Go For Broke” on the other hand is a Hawaiian pidgin term for “going all in” or “betting everything”. “Go For Broke” is something one says when about to do something despite the overwhelming odds. Wikipedia’s 442nd Infantry Regiment (Japanese) offers five translations for “Go For Broke” with the featured translation 当たって砕けろ which is read atatte kudakero. Where atatte is from the verb ataru meaning in this case “to win” and kudakero from kudakeru meaning “to break” so this is “win, or be broke”. Weblio translates this as “take a chance; go for broke; nothing ventured, nothing gained”. The Wikipedia article also suggests the gambling term 一か八か which is read ichikabachika meaning “sink or swim; high-stakes; desperate” or basically an all or nothing gamble. Also, see ichikabachika from The Complete Japanese Expression Guide By Mizue Sasaki. Because ichikabachika is short and to the point, this seemed to me to be a reasonable translation for “Go For Broke”. Except I had nothing to suggest that this phrase was ever used by the men of the 442nd. There is a phrase the Japanese use in such situations, when something difficult must be endured. You would hear the older heads, the Issei, telling others very quietly, “Shikata ga nai” (It cannot be helped). “Shikata ga nai” (It must be endured). Those changed my mind. Today we use shikata ga nai even when the “difficult or trying” situation is of the most trivial nature. Can’t fix the pipe and have to call the plumber? shikata ga nai. Taxi didn’t stop? shikata ga nai. Fingernail broke? shikata ga nai. For Mr. Matsui and his generation, though, it was being forced out of one’s home, stripped of one’s livelihood, and facing indefinite internment by the US government! shikata ga nai. Perhaps the mainland nikkei, American citizens of Japanese decent, used the Japanese term shikata ga nai while the nikkei from Hawaii used the pidgin term “Go For Broke” to try and convey the same thing. shikata ga nai means resignation to the inevitable – and if that inevitable happens to be putting one’s life on the line in battle, against overwhelming odds, to win one’s family’s freedom and one’s honor, then so be it. shikata ga nai. Go For Broke. This is a list of the items referenced in this blog. Wikipedia 442nd Infantry Regiment (English) – Wikipedia is often a good starting point. Wikipedia 442nd Infantry Regiment (Japanese) – Wikipedia (Japanese) reflects the English version and adds interesting items such as the translation of the motto “Go For Broke!” to Japanese. Go For Broke National Education Center – Has many interviews of members from the 442nd. Though, unfortunately, it has many broken links. 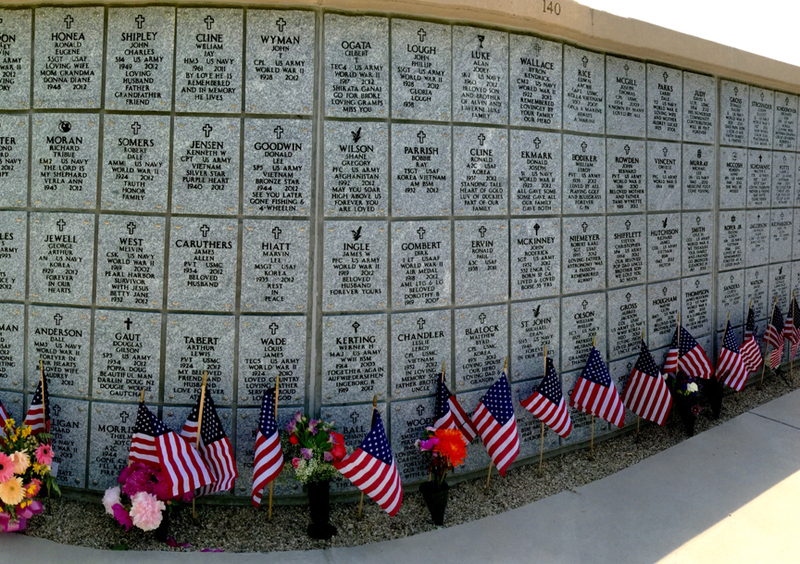 Sons & Daughters of the 442nd Regimental Combat Team – This site has a searchable list of all the members of the 442nd Regimental Combat Team. 442nd Regimental Combat Team Historical Society – The mission of the 442nd Regimental Combat Team Historical Society is to research and preserve the history of the 442nd Regimental Combat Team.